From the beginning, Mālama Hulē‘ia has been supported by hundreds of volunteers from the Kauai community. This help from volunteers is the basis of our success and what allows us to aim ambitiously at eliminating invasive mangrove from the whole Hulē‘ia watershed, as we have done at the Pū‘ali wetland and are now working on at the Alakoko fishpond. Perhaps one reason for such community support is the high value that the people of Kaua‘i place on natural beauty and cultural significance. Continuing help has come mainly from our local community. We have had occasional help from traveling volunteers and those who are part of state-wide organizations. Recently, a crew of volunteer heavy equipment operators (“the machine crew”) worked full time for about two months, starting on January 14. They were not Kaua‘i residents but individuals who live in the Pacific Northwest. Nevertheless, they came to understand and embrace the mission of Mālama Hulē‘ia, as well as the culture and values of the Kaua`i community. And so they have committed their skills and time to the Alakoko project. These guys helped with the January Community Workday in the morning and operated their machines in the afternoon. 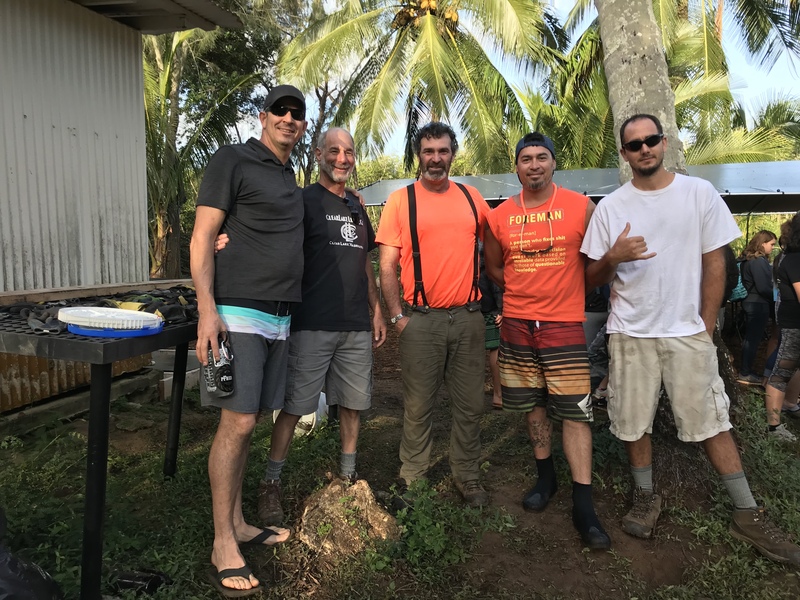 Bryan Valett, long time friend of Sara Bowen, Mālama Hulē‘ia Executive Director, learned of the Alakoko project while visiting and offered to volunteer his time during the mainland winter season when his work is usually down. He also hand picked a crew of highly skilled equipment operators. The crew, in addition to Bryan, consisted of Chuck Hayes, Howard Fox, Skylar Smith, Georges Parks and Brock Struthers. They all volunteered as individuals, independently of their work/company. Their Washington State-based firm, Strider Construction, permitted the equipment operators to help Mālama Hulē‘ia during the mainland off-season months. Bryan Valett also has relationships with a couple of environmental consulting firms that have also sent staff to assist. What the machine crew achieved probably seemed pretty routine to them. But from the perspective of Mālama Hulē‘ia ’s past, their work was nothing less than heroic. In the course of their volunteering on Kauai, they have cleared more than 6.5 acres of mangrove from around the Alakoko fishpond. If we had to work those acres as we have at Pū‘ali, it would likely take us over 6 years to accomplish as much. Of course the big excavators made a huge difference. But the dedicated and continuous volunteer time given has also been a big contributor to this quick success. So we owe this team of heroes a huge mahalo! And as much as we appreciate their volunteering, they told us they were appreciative of the experience they had being immersed in the cultural significance of the work they did for the fishpond and community here. It was fitting that their stay ended with a Hawaiian style celebration staged for them by Mālama Hulē‘ia on the grounds of Alakoko. Please join us in working in the wetlands area surrounding the Alakoko fishpond. We’ve cleared 6+ acres of mangrove over this last month and need help prepping for and planting natives. Alakoko Fishpond driveway at 2342 Hulemalu Road – Please drive SLOWLY! Monthly Community Workday’s at Alakoko will be held on 4th the Saturday of each month. Mark your calendar – we’d love to have you join us! Lunch is provided so please let us know if you will be joining us by email to info@malamahuleia.org or signing up on our Facebook Event. regional Science and Engineering Fair for her project “Investigating the Effects of the Removal of Red Mangrove Trees on the Ecosystem of Kauai” She worked on this project at Alakoko fishpond with the support of Malama Huleia staff Paleke Flores and Sara Bowen, and the scientific mentoring of Dr. Carl Berg, Malama Huleia BOD. Dennis Fujimoto/The Garden Island Kauai High School student Isabella Parsons shows off her awards and presentation, Saturday during the Kauai Regional Science and Engineering Fair Award Ceremony. Her own water quality sampling was done at three sites in Alakoko fishpond and one at Puali wetland over a two month period, which coincided with the beginning of mangrove removal from around the edges of Alakoko. She compared her data with the monthly water quality data Malama Huleia has collected for the past 20 months. She then correlated it with Malama Huleia’s data on acres of mangrove removed during her sampling period. Dennis Fujimoto/The Garden Island Isabella Parsons answers questions about her investigations on the removal of Red Mangrove on Kauai’s ecosystem. As first place winner in the Senior Division, Isabella will go on to the State fair on Oahu and the Intel International Science and Engineering Fair in Phoenix, Arizona this spring. In addition to winning top Senior Division project, Isabella also won in Plant Sciences, Senior Division, and awards from Surfrider Foundation, NTGB and NOAA. According to Dr. Carl Berg, Isabella collected lots of data, did lots of analysis and lots of parsing to get to her general conclusions. He will continue to work with Isabella to try to improve her conclusions for the state-wide competition and the fair in Phoenix. For the next 5 months, ʻōpio from the moku of Puna will be taking part in a once a month, residential program where they will be engaged in Hawaiian cultural enrichment and STEAM hands-on, educational activities. Some of these activities include; learning the historical and archaeological significance of Alakoko, Hūleʻia and surrounding ahupuaʻa, water quality testing, mapping the geography and topography of Alakoko, learning fishpond dynamics and maintenance, mālama ʻāina: eradicating invasive and planting natives and learning about the importance maintaining a healthy and productive mauka to makai aquifer. If you have a teenager that is interested in registering for this amazing learning opportunity, contact NPN at 808-245-8287. Our machine crew, led by Bryan Vallet, is doing quick work in taking down the mangrove around Alakoko Fishpond. Today the excavator operated by Georges Parks broke through to the pond. This is a milestone accomplishment. Other members of our machine crew are Skylar Smith, Brock Struthers, Howard Fox, and Chuck Hayes. Meanwhile, the Menehune are nearing the first break in the wall of the fishpond, where there is also a break in the mangrove. They expect to reach the water there in one or two more workdays. We have a community work day this Saturday, January 26, 2019. Come and help us clear the invasive red mangrove from the historical Alakoko Fishpond. Come prepared for sun and mud, and lots of aloha. On January 15, 2019, the Malama Huleia Board of Directors was joined by Ruby Papp and Chris Kauwe. These new Directors replaced Pepe Trask and Steve Yee, two founding members of the organization when it was part of the Kaiola Canoe Club. Congratulations to the new Directors Ruby and Chrys, and Mahalo to outgoing Pepe and Steve.